This is an advertisement for Benjamin B. King, Stationer and bookseller. 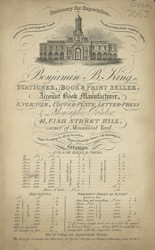 King not only sells daily newspapers and periodicals but is also advertising his services as engraver and letter press and lithographic printer. During the 19th century there was a ‘thirst for knowledge’ and a desire for self improvement. The literate proportion of the population grew throughout the century and with the development of faster and more efficient printing presses periodicals, magazines and newspapers were produced to meet the demand for literature.